Describe your idea or project you are working on. I'm working on OpportuniME, a mission-driven startup company with the goal of helping high schools, guidance counselors, and their students to efficiently find and create high quality opportunities (summer enrichment programs, internships, research, etc.) for student passion, career, and self discovery. Actually, the last part, “self discovery”, is where the “ME” part comes in the name, OpportuniME. As the web platform is being developed, the newsletter is active and goes out every Wednesday night. It features high quality opportunities and experiences for students to take advantage of! I started OpportuniME because I personally went through the stressful and time-consuming process of trying to find meaningful and quality opportunities as a high school student by searching for hours on Google. I conducted a market research survey which confirmed that high school students from all across the country face the problem too.The research participants reported that some leading causes for trouble finding meaningful opportunities as a high school student are: gaps in information access (for multiple reasons), inability to vet opportunities that are eventually found, scarcity of time to search for opportunities, outdated counselor opportunity lists, and more. I analyzed the data from the survey and decided that this problem needed a solution. Thus, OpportuniME was born. The challenge I've faced is balancing my studies in school and starting a company. It's been both challenging and exciting at the same time! Success in both are very important to me. Working to find balance has helped me learn how to better manage and allocated my time. I utilize Google calendar, my Bloom Vision planner, and a calendar near my desk to do this. The most rewarding thing has been people telling me that I have inspired them. To be an inspiration to others--wow, that's huge. When I hear that, I think of Oprah Winfrey who has been one of my biggest inspirations since I was a little girl. Her story of breaking barriers and overcoming so many challenges makes me realize that there is really no excuse for not going after my goals. Oprah has made history as a ‘first’ for so many of her amazing accomplishments. I hope to meet her one day! Recently, I was about to go on stage to speak at a conference and the emcee introducing me whispered to me and said “When I introduce you, I’m going to only say your first name. You know how people hear ‘Oprah’ and automatically know who that is? That’s going to be you.” That itself was such an honor and I found it really motivating. I've been invited to speak at events at companies, schools, and organizations about my passions for entrepreneurship (which to me, is seizing opportunities & creating opportunities), OpportuniME, and other topics I speak on. I am grateful to have various platforms to share my ideas and passions with others. I would have to say marketing and getting the word out. I think that with any new company, project, or initiative, getting the word out there is really crucial to reaching your target audience and even people who may not be the target, but would be instrumental to the success of what you're working on. I'm also looking into growing the OpportuniME team so that product development, revenue, and impact can be accelerated! In short, having more people engaged with OpportuniME in some way would be helpful! CEO of a major global company (hopefully one of my own!) or really any job that excites me, allows me to travel a lot, and interact with interesting people. I am the Vice President of my school's Business Professionals of America chapter, a contributing writer for a few publications, and an ambassador for the Diamond Challenge, the largest global entrepreneurship pitch competition for high school students. In September of 2016, I became a Headband Hero for Headbands of Hope, a company where for every headband sold, one is donated to a child with cancer. I'm also a member of the Conscious Capitalism organization which has the mission of advancing and elevating humanity through business. I love to travel! It has given me a new perspective of the world, increased my empathy, and has allowed me to meet a lot of awesome people. I also enjoy writing, reading, and creating just about anything. Also, I speak at conferences, companies, organizations, and various events about: diversity & inclusion, entrepreneurship, economic empowerment, productivity, and purposeful leadership, which helps me to keep improving my public speaking skills frequently and it is a hobby that can also be a source of income. First of all, you need to know within yourself that your ideas, thoughts, and dreams MATTER. However, you can't stop there! 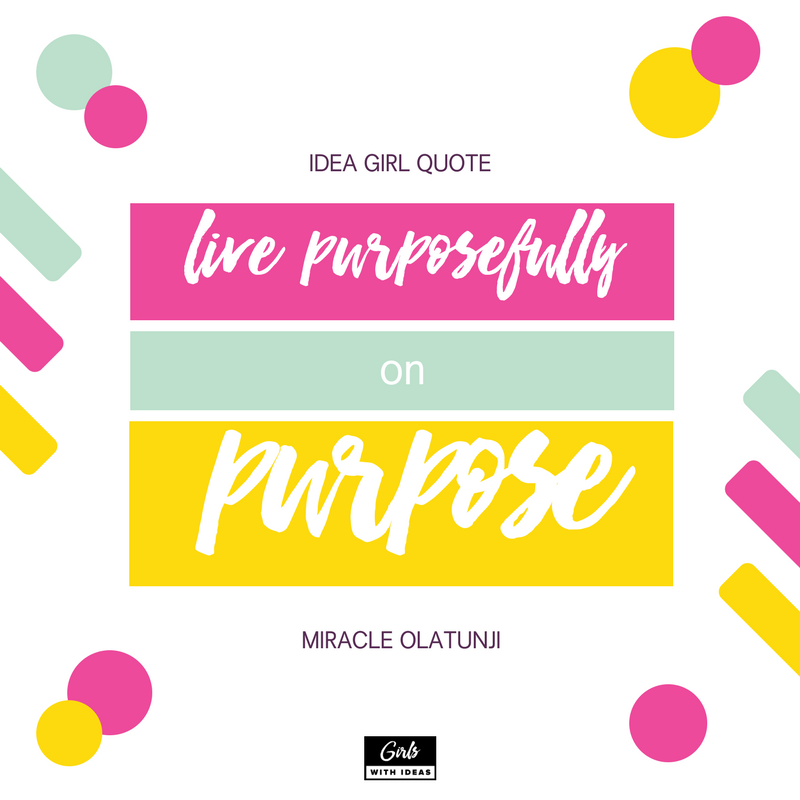 You now need to take those ideas, thoughts, and dreams and turn them into real companies, initiatives, services, etc. This is the challenging part but it is so worth it. Don't be afraid to ask for help and advice when you face challenges. And always remember to SEIZE the entrepreneurial opportunities that exist, but don't be afraid to CREATE ones that don't exist. 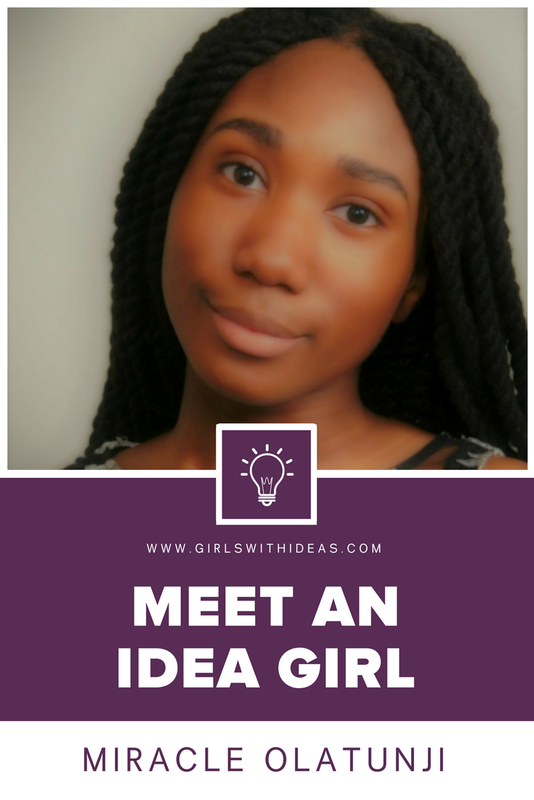 If you know a girl with a story like Miracle's, nominate her to be our next featured Idea Girl!